For the first time in Romania – an exhibition of interactive art, presenting works which have been previously shown at the well-known Ars Electronica Festival in Linz, Austria. All projects have been developed within Interface Culture Lab, a master program at University of Art and Design in Linz. The exhibition is organized by AVmotional Association, Bucharest and Interface Culture Lab, Linz. Kindly supported by Austrian Cultural Forum in Bucharest and University of Art and Design, Linz. 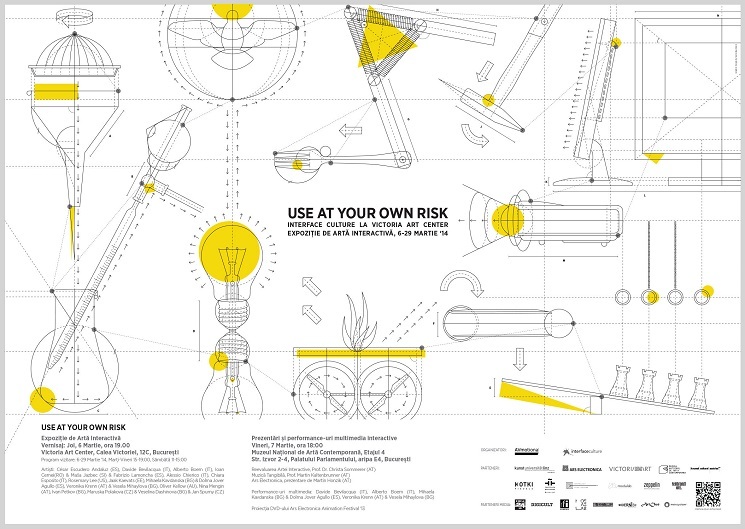 USE AT YOUR OWN RISK contains 14 different projects by Austrian and Austria based artists. The field ranges from multimedia art, interactive audio-visual to food art performances. Presentation of the Master course and informal meeting between Interface Culture Lab lecturers and local students interested in the field of Interactive Art. Presentations focused on recent aspects in the fields of Art, Technology & Science. Tangible Music, presentation by Prof. Martin Kaltenbrunner, Interface Culture Lab, University of Art and Design, Linz. Re-Evaluating Interactive Art, presentation by Prof. Dr. Christa Sommerer, Head of Interface Culture Lab, internationally renowned media artist, researcher and pioneer of Interactive Art. Ars Electronica, presentation by Martin Honzik, Head of Ars Electronica Festival.